Game show host Pat Sajak has teamed up with puzzle leader Penny Press® to create Pat Sajak's Get-A-Letter Crosswords magazine. 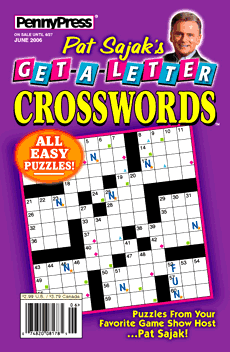 Get-A-Letter Crosswords uses Pat's patent-pending Code Letters puzzle-play system that adds a new way to solve puzzles faster than ever before. Of course, Pat loves word games, and he believes you'll be as excited as he is about this fun way of solving crosswords. SPECIAL DISCOUNT for Pat Sajak Games web-site visitors. For a limited time only, patsajakgames.com visitors receive an additional 10% off a 1-year subscription to Pat Sajak's Get-A-Letter Crosswords! Go to Penny Press's web-site, order your subscription, and use the code PAT10 at checkout. About Pat Sajak's Get-A-Letter Crosswords. These exciting, fun puzzles are solved like any regular crossword, with additional help from Pat to "Get A Letter"! Look at the sample puzzle to the right. Start by answering some clues. In each puzzle, some letter spaces have been coded with symbols. Each symbol represents a different letter. When you !Get A Letter! in a coded box, you can fill it into the key above the grid. You work back and forth in this manner, answering clues and filling in letters, to complete the puzzle. Each puzzle has its own code. It's like having Pat there to "call out" the location of certain letters for you! Get the answer to this puzzle at Penny Press's Pat Sajak page. Order your subscription to Pat Sajak's Get-A-Letter Crosswords and get 10% off with discount code PAT10 today! Be on the lookout for more puzzle fun! Click here to sample some of Pat's Get-A-Letter puzzles. Sample is in the Adobe Acrobat (.pdf) format.